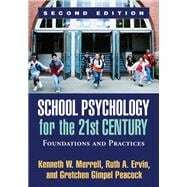 A leading introductory text, this authoritative volume comprehensively describes the school psychologist's role in promoting positive academic, behavioral, and emotional outcomes for all students. The book emphasizes a problem-solving-based, data-driven approach to practice in today's diverse schools. It grounds the reader in the concepts and tools needed to become a competent, ethical practitioner; implement and evaluate multi-tiered interventions; and facilitate systems-level change. Useful pedagogical features include illustrative vignettes and end-of-chapter discussion questions and activities. *Incorporates up-to-date research findings and professional standards. *Expanded coverage of response to intervention, cultural and linguistic diversity issues, and evidence-based practice in mental health. *Chapter on legal issues includes expanded coverage of IDEIA and other recent federal mandates. Kenneth W. Merrell, PhD, until his death in 2011, was Professor of School Psychology and Director of the Oregon Resiliency Project at the University of Oregon. For 25 years, Dr. Merrell's influential teaching and research focused on social–emotional assessment and intervention for at-risk children and adolescents and social–emotional learning in schools. He published over 90 peer-reviewed journal articles; several books and nationally normed assessment instruments; and the Strong Kids programs, a comprehensive social and emotional learning curriculum. Dr. Merrell was a Fellow of the Division of School Psychology (Division 16) and the Society for Clinical Child and Adolescent Psychology (Division 53) of the American Psychological Association. He received the Senior Scientist Award from Division 16, the Division's highest honor for excellence in science. Ruth A. Ervin, PhD, is Associate Professor of School Psychology and Special Education at the University of British Columbia, Vancouver, Canada. Her professional teaching and research interests lie within the domains of promoting systems-level change to address research-to-practice gaps in school settings; collaborative consultation with school personnel, parents, and other service providers for the prevention and treatment of emotional and/or behavioral disorders such as attention-deficit/hyperactivity disorder and oppositional defiant disorder via a data-driven, solution-oriented problem-solving approach; and linking assessment to intervention to promote academic performance and socially significant outcomes for school-age children. Emphasis in Dr. Ervin\u2019s work has been placed on systems-level change and the merging of research and practice agendas to support school personnel in the timely provision of primary, secondary, and tertiary prevention efforts to address student needs. Gretchen Gimpel Peacock, PhD, is Professor of Psychology at Utah State University, where she is on the program faculty of the specialist-level school psychology program and the PhD program in clinical, counseling, and school psychology, and where she serves as head of the Department of Psychology. She regularly supervises practicum students in the departmental clinic. Dr. Gimpel Peacock is a licensed psychologist and educator- licensed school psychologist. Her publications and professional presentations are in the area of child behavior problems and family issues as related to child behaviors as well as professional issues in school psychology. Dr. Gimpel Peacock serves on the editorial advisory boards of several school psychology-related journals.